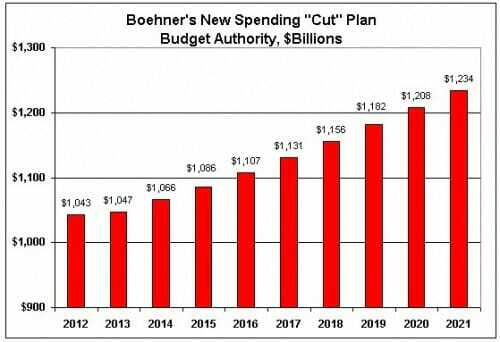 Only government workers could consider this proposed spending profile to be a "cut". Below is Boehner's discretionary spending plan (numbers exclude programmed spending such as entitlements). This reminds me of my Forbes column a while back comparing the Federal budgeting process with that of a private enterprise. Board Member: Let’s get started. After an absolutely disastrous year, financially, we’re now five months into our fiscal year and you still have not presented us with a budget for this year. Why? CEO Obama: My staff was waiting until their employment contracts were renewed before we presented a budget. CEO Obama: You remember — many of my associates in the company had their contracts up for review in November. They were afraid they might lose their job if you did not like their budget work, so they delayed introducing any budgets until after you renewed their 2-year employment contracts. Board Member: That seems unbelievably deceptive and feckless. But let’s leave that aside for a moment. November was still several months ago, why have we seen no budget since then? CEO Obama: Well, as you know, I have a number of rivals for my job in this company. I want to force one of them to suggest a budget first. Board Member: Why is that? It seems to me it is your job as leader of this organization to define the budget, particularly given the unprecedented fiscal challenges we face. CEO Obama: If I propose a budget first, everyone will just shoot holes in it. If I let someone else come forward with the budget, I can snipe at it and make my rivals look worse. In particular, I think that Ryan guy down in Finance may be dumb enough to create a plan. If he does, I can spend so much time making him look bad you will forget I never submitted a plan of my own. Note that this is just from one narrowly focused bill and for one single metropolitan area. For this one post, I will not be a libertarian and wonder why the government is spending money on some of this crap. Instead, for one post, I will be a good little technocrat and assume that the government should be doing all these things and criticize the process. If I were a technocrat, I would argue that Congress already funds an ENORMOUS beauracracy to route federal money to theoretically the most productive spots. I mean, that's the whole technocratic argument for all this government spending, isn't it? That the government run by experts in the field can top-down allocate resources better than some bottom up market process? Ideally, in any budgeting process, you look at your goals for a pool of money - say to cure breast cancer or to provide worker retraining, and you rank projects and allocations against this goal. I believe this to be an impossible task for a variety of reasons, some of which are described here. But even if you buy into this theory of technocratic fascism, you STILL have to be appalled by these earmarks. Because each and every one are an override of any kind of prioritization and thoughtfullness that might exist in the budgeting process. Take #9. So the government has a goal of providing dental services to low-income people. Fine. Then shouldn't it take its dental services budget and allocate it on the best cost per patient served basis? Does the Arizona Dental Foundation fit into this picture? I bet no one in Congress knows. In fact, I bet it DOESN'T fit this efficient allocation of funds criteria, because otherwise someone in Congress wouldn't have overrrided the funding process to push $100,000 their way in an earmark. And even if this is a non-profit, shouldn't this kind of thing be bid on -- say ask for proposals of who can do the most with $100,000? Some of these others are pretty obscure, and say something in and of themselves about the reach of the federal government these days. But take #3. Is the Translational Genomics Research Institute the best place to spend 3/4 million to get the most bang for our health research dollars? No one probably knows, but what I can tell you is that it is the darling of our local political establishment (just read its history, all about political namedropping, new facilities, and whoring for taxpayer funds without mention of any actual research). It has political figures such as our current governor on the board, so you might be able to guess how they got their earmark. Or look at #8. Scottsdale Healthcare is a private company, though a not-for-profit. It is a large provider of private, paid medical services in our area. It, out of all of its competitors in town, both non-profits and for-profits, was chosen by Congress to get its medical records system upgraded by the US taxpayers, why?